Preheat oven to 400 degrees F, or 200 degrees C.
Peel potatoes and boil in salted water until soft. While still hot, press the potatoes until pulverized. Let cool. Add eggs, flour, and salt. Blend together and knead well. If dough sticks, add more flour gradually until it no longer does. Shape into a roll about 2 inches thick. Cut the roll every 2 inches to create about 6 or 7 pieces. Knead each piece down to about 1/4 inch thickness to create the wraps. Spread butter on each dough wrap. Peel and slice apples thinly. You may chose to chop them instead to get a better fit. This is also fine. 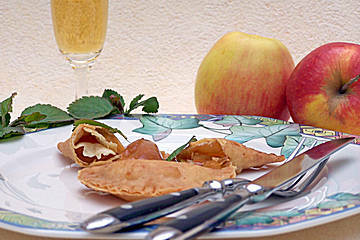 Fold each wrap in half over the apple. Gently press the edges together to get a good seal. Place the Maultaschen in a large baking dish and coat both sides with the melted butter. Bake for 40 minutes. (See next step for interim steps in baking process). In a small saucepan, place milk and sugar. While stirring constantly, allow to boil. Then bring mixture to simmer until sugar is completely dissolved. Add the thickened, blended milk mixture into the dish with the ravioli after about 10 minutes of baking time has elapsed. Serve with some vanilla sugar sprinkled (optional) on the Maultaschen. How thrilling to have found this! I have been searching for several years to find any mention of an old family favorite dessert from my mother’s side. Her crowd was originally from austria and by the time I was enjoying this recipe in my grandmother’s kitchen it’s name had evolved to ‘multartzen”. Made in sweet pockets filled with apples or peaches, it was baked swimming in sweetened cream. I am delighted to have found your recipe and now know how it is really spelled. I assume my grandmom’s variant of this belly busting dessert is as evolved as her recollection of its name. Let me know if you have any interest in her recipe and I’ll send it along. I’m so happy you found this, Lucy! This recipe is apparently a real nostalgic trip for many people, which is how I came across it. I was researching for another reader, and was thrilled to find it. I have yet to make it for my little one, but I’ve no doubt he would love it. We would love to share your grandmother’s recipe if you are willing! You may sign up and contribute it yourself if you would like, or I would be happy to do it for you. Wow! I can’t believe our old family tradition is a real recipe. The memories my siblings and I have of this recipe is that our grandmother (mom’s side) would make HUGE batches for all of her kids (8) and famililies during deer hunting season. We would have this as the main meal since dad was gone. What a marvelous find this is. Grandma always called it “mytachen” and we never knew the origins. Are you sure that the salt content is right? Hi, Caroline! Based on the original recipe I took this from, yes. I believe they estimated the salt used in the water for boiling the potatoes, as well as the salt used in the dough. I did not catch that the first time. You really should only need about a teaspoon in the dough itself. I would dare say you could even avoid salting the water. I do that myself, as we are sodium conscious. I am changing the recipe to reflect 1 teaspoon to avoid any further confusion. Thanks for catching that!